In a hermetically sealed, post-apocalyptic urban environment several centuries hence, Logan 5 (Michael York) and his friend Francis 7 (Richard Jordan) lead unquestioning lives of hedonism. Entertainment comes in the form of casual sexual liaisons and gladiatorial games in which those who do not wish to undergo euthanasia at the age of 30 vie for the illusory chance of continued life. As sandmen, Logan and Francis are charged with tracking down and killing runners -- those citizens who will submit to neither renewal (a peaceful death) nor carousel (a gladiatorial battle) when their time comes. 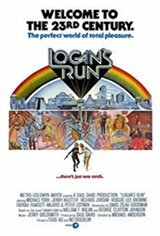 When Logan grows intrigued by a beautiful young woman, Jessica 6 (Jenny Agutter), who plans to become a runner, he is forced to question the fundamental principles of his society. And when his superiors force him to pose as a runner himself to weed out Jessica's guerilla underground, Logan finds himself fleeing the city in search of a mythical place called Sanctuary where people are allowed to live out their natural spans.